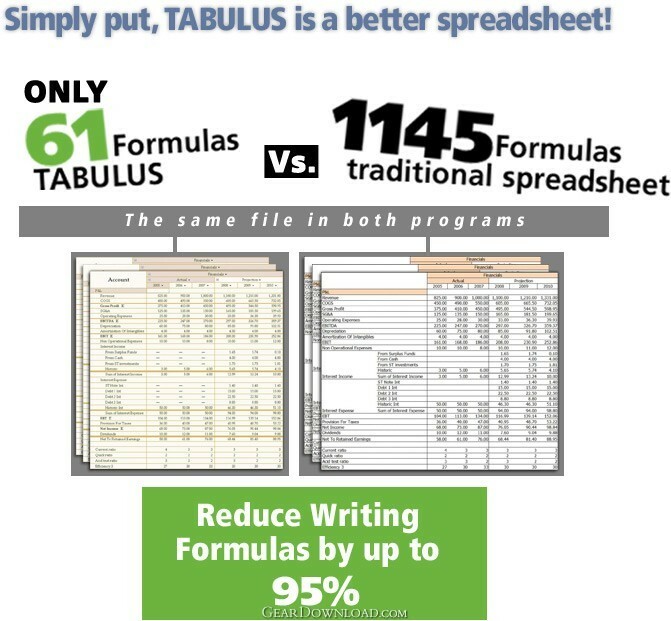 TABULUS® combines the flexibility of a traditional spreadsheet with the structured approaches developed for databases and financial products, to produce a more reliable, more maintainable solution to your spreadsheet needs. TABULUS® reduces maintenance costs in three ways. It automates common formulas such as sums, running totals, averages etc. It eliminates the need for links. It eliminates the need to write redundant formulas by applying single formulas to groups of cells automatically. Formulas in TABULUS® do not depend on the position in the sheet, so they won’t break if you rearrange a report. TABULUS® maintains formulas for you. The risk of accidentally breaking a formula is eliminated. The TABULUS® table oriented structure allows you to create and maintain spreadsheets which wouldn’t be possible with a traditional spreadsheet. TABULUS® includes automatic inflation adjusting and currency conversion. Do less work and impress your business associates.